So, I delivered another batch of fresh books to my local public library again today. The last--and first--time I donated was back in December, when I gave them 5 books, among which were doubles I had of Ice by Sarah Beth Durst, Ash by Malinda Lo, and Hush, Hush by Becca Fitzpatrick. I knew I had done the right thing when I saw the librarians' eyes widen and gleam as they pored through the meager titles I had given. One of them picked up Sarah Beth's book and exclaimed, "Oh! I just submitted the next list of titles I wanted to buy for our collection, and I really wanted this one but ended up not being able to put it on the list due to budget constraints." Well, you can imagine how happy that made me feel! It took them over two months to process the books and finally put them in circulation (I know this because, uh, I checked like a fanatic). I don't know why it took so long--is that normal? I hope not. Any librarians know how I might be able to help speed up the process? The library in my local town has always been extremely small, without the added benefit of a generous town budget towards investing in teens' interests like the public library in the next, more working-class town over has. I've found that most of the books I requested via interlibrary loan tend to come from outside my own public library; mine is unable to buy very many new releases, a shock to me after over a decade of being spoiled by the gorgeous and extensive library in my hometown. Now, with all the access I've been getting to new books and book-loving people, I cherish any opportunity I get to give someone else--a version of a younger me, perhaps?--the joy of finding new and varied reads to get lost in. So I encourage you to do the same! It's super easy to do: here's no need to keep a book around if you think you won't read it again, learn from it, or care about it. Not even if you received a signed copy of a book, for example. I'm much happier knowing that these books will be available for other readers to love. It's a good feeling, and really builds a sense of community between readers, bloggers, and libraries that I'd like to see and help grow in the future. Try it out for yourself! I just donated a stack today, but I am curious what will happen to them. I know they have a big sale every year, I have to admit I will be bummed if I see them on the sale pile. I'm sure this sounds ridiculous but I've never thought about. I don't have enough books to share however when I do (which I'm sure I will) I'll be looking into it for sure! my library is the same as kelsey's, except they sell them trade/paperbacks for $.50 and hardcovers for $1--but donating books to the library helps in some way no matter what i guess. 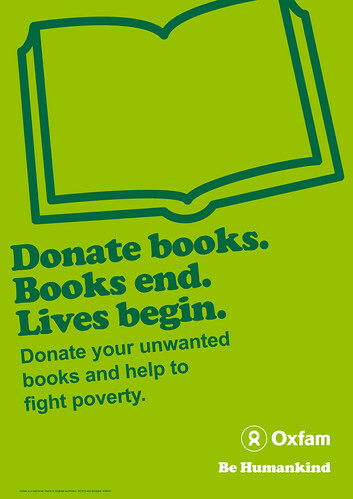 As a Teen Librarian I congratulate and thank you for your donations!! Budgets are always tight and books are always welcome! I wish more people thought to do the same. I will tell you that if you just drop books into a book drop or hand them over to a random person at the Library, they can sometimes end up in the book sale instead of the circulating collection. If you stop into the Teen Dept. or talk to the person that does the YA book ordering, though, I can guarantee you that 90% of those Librarians would gladly personally accept your donations and add them to the collection. Depending on the Library, that can take some time, but they'll get there eventually!!! Another great place to donate is your local high school! I'm a high school teacher and my #1 priority is building my classroom library for my students. I have over 600 books, many of which are current and popular YA titles, but all of which I buy with my own money if I don't get them donated. Find a local teacher who is all about literacy and make her/his day, or donate to the school library so lots of kids can use your books. There are so many budget cuts in education, and, sadly, libraries don't get to spend $$ on new books. Thanks for sharing this! I'm a future librarian and this is a great story to hear. Like Jessica said, if you talk to the Teen Librarian, there's a greater chance you'll get your book added to the collection! I always donate to the library I work at, so that my teens get to read the awesome books that I'm already done with. As a librarian, it's hard to choose between books working in a budget. As much as I might have loved Book X, I might have to stock Book Y because it will circulate more. As for the turn-around to get the donated books into circulation, that seems like a LOT of time to me. Our books are normally turned around within a few days after arriving at the library. I am a branch librarian, so I can tell you for sure, donations are appreciated!! I think that is a long time for the books to go in circ. Usually ours will go in within a couple of weeks. I donate a lot of books to my lib., so I can just give them to our cataloger!! I agree talking to the teen lib. or a supervisor will usually get them put in circ. Budgets for libraries are awfully tight and are going to get worse!! I'd love to donate books to my local library. I even looked into it. But I'm stubbornly annoyed that they stock some YA books (e.g., Ellen Hopkins) in the adult section. I don't want to donate books for YA readers if YA kids won't even see them or be able to check them out. Plus, like some others, I'm not certain that donated books go into circulation. I'll have to check into the issue more. I would love to donate books to one of the local library systems... but they'll just end up in the book sales. When I checked the donation guidelines for one of them, they stated that they accepted paperbacks (presumably because they don't have to enter them into the system as anything other than a "paperback" -- lazy!)... and that was pretty much it. My nearly new hardcovers would just end up in the bargain bin at the next book sale. And then the library would use the money to buy more bad Christian fiction (seriously... I don't know who makes the buying decisions for our local library or why they were allowed to do so). If I were to donate to a library, I would do so because I wanted lots of people to have free access to the books. Otherwise, I might as well just dump the whole lot at the nearest used book store. This is so sweet of you. I need a place where I can donate some of my old books. I buy a huge amount of my books from the library book sale and am always sure to give them a few extra dollars on top of what I pay for the books I bought. How generous and awesome of you to donate like you do! And it's really exciting that they actually take the books you donated and put them into circulation. Everything donated to my local library branches is actually sold at a Saturday book fair, with the proceeds going toward the library's needs. The physical books we give them -- many of them hardcover, like new -- are then sold for $1. Literally. It kind of breaks my heart, especially considering if they went to purchase that book for the library, it would set them back $25! The system doesn't make sense to me and is always frustrating locals. Still, if you stop by that Saturday book sale (as I occasionally do)... you're bound to get some good deals!